Maria “Angelita” Sarate, 85, of Bryan passed away Monday, November 5, 2018. Funeral Services are set for 10 AM Friday November 9 in the Santa Teresa Catholic Church. Father Victor Mayorga will officiate and burial will follow in the Bryan City Cemetery. Visitation will be from 5-8PM Thursday, November 8 with a 6PM Rosary in the Chapel of Trevino-Smith Funeral Home. Born May 8, 1933 in Hays County, Texas she was the daughter of Feliciano Mendez and Refugia (Rodriguez). She enjoyed cooking and listening to music as well as dancing. Angelita liked rooting on her team the Texas Aggies but most of all loved spending time with her children and grandchildren. She is preceded in death by her parents; her husband of 13 years, Genaro Sarate; a son, Emilio; daughter, Balbina; and one grandson, Donavan. 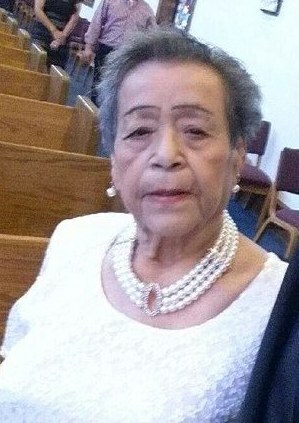 Angelita leaves behind to cherish her memories, two sons, Joe Sarate and his wife Ermina, and Rudy Sarate and wife Christina; three daughters, Ecidra Sarate and James Cavazos, Anselma and husband Mario Martinez, and Nancy and husband Gerardo Garcia; four brothers, Raymond Mendez, Benito Mendez, Guadalupe Mendez and wife Rachael, and Felix Mendez and wife Anna; one sister, Gloria Lopez; eighteen grandchildren, twenty six great grandchildren; and three great-great grandchildren.